Birth: 1682 Drumaboden, Donegal, Ire. The following map shows the location of family acreage in Augusta County, Virginia. 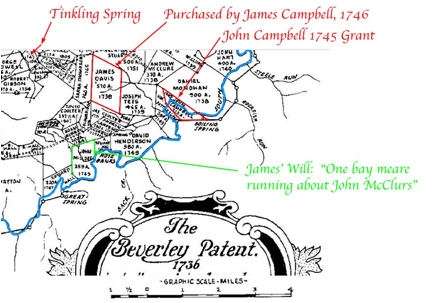 It shows 570 acres James Campbell purchased from James Davis in 1746, and shows 325 acres his son John acquired in 1745. 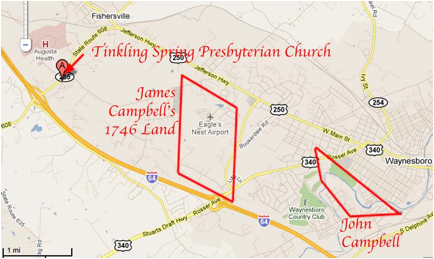 And it shows the location of the Tinkling Spring Meeting House, where there is a large monument naming James Campbell as one of the pioneers into this part of the Shenandoah Valley. And in green it shows the land of a neighbor John McClure, who is mentioned in James’ 1753 will as taking care of a horse that James wants to give to his granddaughter Elisabeth White. So, in today’s world, it appears that James’ land is the location of the “Eagle’s Nest Airport”, that appears to serve the modern communities of Fisherville and Waynesboro, Virginia. Rent a car there, and drive about 22 miles southwest to the community of “Steeles Tavern”. This is where James Campbell’s son-in-law and daughter, Samuel Steele and Margaret, settled. And there the Steele’s next-door neighbor was Robert Alexander, whose son Peter married Samuel Steele’s daughter Elizabeth Jannett “Jenney” Steele. The stories herein are best understood as part of a series of stories about a group of connected families that all settled (or originated) in Augusta County, Virginia, in the 1700’s. The following sketch shows how they are connected. There are separate story files for each of the men marked in red (wives are discussed jointly with their spouses). There are many references herein to The Chronicles of the Scotch-Irish Settlement in Virginia: 1745 to 1800 by Lyman Chalkley. This is a large work, with three volumes of about 600 pages each, containing most of the abstracts of court records in Augusta County. This work is now in the public domain, and readily available online. It is a good starting place, but contains many errors of omission and transcription. To be used with caution. James’ early presence is commemorated by a marker at Tinkling Spring Presbyterian Church: “Sacred to the Memory of the Immigrants to this Valley who turned the Wilderness into Habitations: On November ye 12th 1744 these were assessed 12 shillings per family for building the first Tinkling Spring Meeting House… (in) John Finley’s Quarter… James Campbell… Samuel Steel… Isaac White… John McClure…”. (Chalkley, Volume 1) “August 19, 1752. James Campbell, qualified Captain of Foot (soldiers)”. Will written and signed 5 Nov 1753. Secondly I leave to my son Daniel Campbel Twoo Hundred acckers of the Land I now inoy (enjoy?) to be Laid off on the North East Line which two hundred accrs I allow to Take in my Dweeling house wherein I now Live with the whole ye medow and Cleare Land appertaining to the Same, in Case he Ever Come to Clame the Same. I also alow my wife Margret Three Cowes for hir Uss Such as she Sees Cause to Chuse and one nyne year old bay meare which Runeth now about John McClures and one horse Colt a yearling past. I alow my wife to Receive all Debts Due or Coming to me with all the Houshould plemihing (Plenishing?) and to inoy (enjoy?) or dispose it as she sees fitt. Comment: Wow. Not sure I understand this one, but it mentions both Margaret and James Campbell, and is dated shortly after James’ death. Weird. I suspect that this Margaret Beard may somehow be related to the Thomas Beard who was the father of the Esther Beard who married Robert Alexander. They all arrived in Augusta County at about the same time. However so far I have not found any source that describes a connection. traces James CAMPBELL’s ancestry back to the Roman Emperors and early kings in England -- back to 772 BC. The owner of this site, James Dow Allen, traces his ancestry back to Adam and Eve, and includes much of that below. If you want to extend the following, you could start with “Cunedda King of Britain” and use James Allen’s data to go on back! Do I believe I am descended from “Cunedda King of Britain”? Well, if he in fact existed and he had children, then I absolutely believe there is a VERY high probability he is one of my ancestors. The mathematics of genealogy demand it. I am probably related to him by hundreds or thousands of different ancestral paths. What might be in question, however, is whether the path described below is one of the accurate ones! + Anna (Enygeus) "The Prophetess"